This post contains details about MailPoet 2, which is still functional, but the post will be updated for MailPoet 3 soon. We’ve used MailChimp in the past, a good email marketing service, but then we found MailPoet Newsletters, which I consider to be the best newsletter plugin for WordPress. Now, I don’t know about you, but I love the fact that I can manage my subscriptions and send emails directly from WordPress. And besides doing everything directly from WordPress, it’s also dead easy to use. You don’t have to read long guides, or spend two hours figuring things out. You’ll get the hang of it real quick! Let’s check out some of its main features. You can send emails to 2000 subscribers, which is not such a small number if you ask me. As you can see, it offers a lot for just a free version. Until you reach the 2000 subscribers limit, you won’t miss a thing. The Pro version starts at 75€/year (95$) for a single website, which is not expensive for an entire year. You can check the other packages here. As I said, it’s very easy to use. You shouldn’t encounter any problems. The first time you check the plugin you’ll most probably see the welcome page, where you can watch a 6 min video, or you can jump straight to business if you feel confident enough. I suggest you start with the Settings section first. This is the first tab. Basically here you have to enter some information. You should enter your company’s address to avoid spam filters. If you don’t feel comfortable doing that, or you don’t have a company, then don’t add anything… On MailChimp, this wasn’t optional, which was really annoying. Add an email to receive notifications, like if someone subscribes or unsubscribes. At Sender of notifications, you have to add a FROM name and an email for your notification mails. Or you might want to change the Unsubscribe text and page (which is a post in fact). MailPoet directs the users to a post that contains the unsubscribe message, not a page. 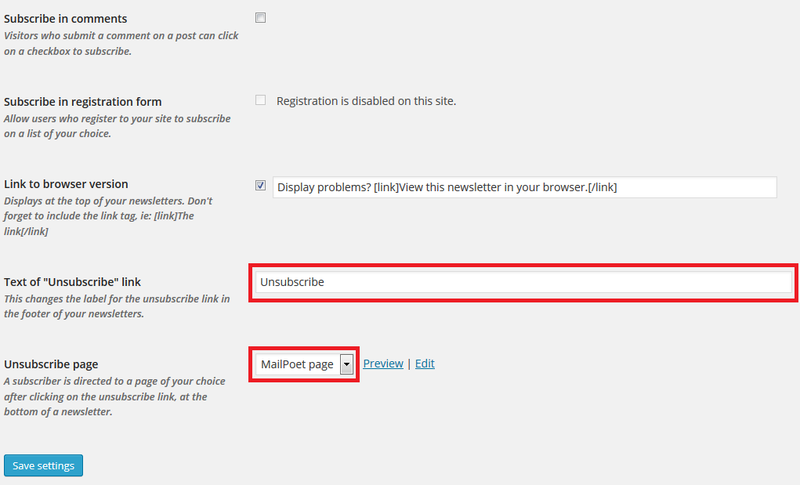 Preview MailPoet’s default unsubscribe post, and if you don’t like it, edit it or create a page (not post). The first thing you might want to do is to change the form’s name by pressing the Edit button at the top. On the left side, you have your form. As you can see, it’s a simple form with an email box and a subscribe button. You can insert more fields from the field area on the right. You can also create other fields (text areas, radio buttons, checkbox, etc.). You can edit the fields once you dragged them on the form. Under your form, you have to add your list(s) of subscribers. You need to create that in the Subscribers section, but we’ll get to that in a minute. The last thing you need to do is to set your After submit message, or you can leave the default one that you see in the image. Note: the form won’t look like the one in the image once it will be added on your website. It will most likely blend with your theme’s design, as ours did, so you don’t need custom coding or something like that. I strongly recommend enabling Signup confirmation to avoid fake signups. In the Email content, you can get rid of [lists_to_confirm] if you do not wish to reveal your list’s name. Also, just like the Unsubscribe part, the plugin directs the users to a post with the confirmation message, not a page. So, check out the preview, and if you don’t like it, edit it or create another page (not post). Fill in Reply-to name & email. 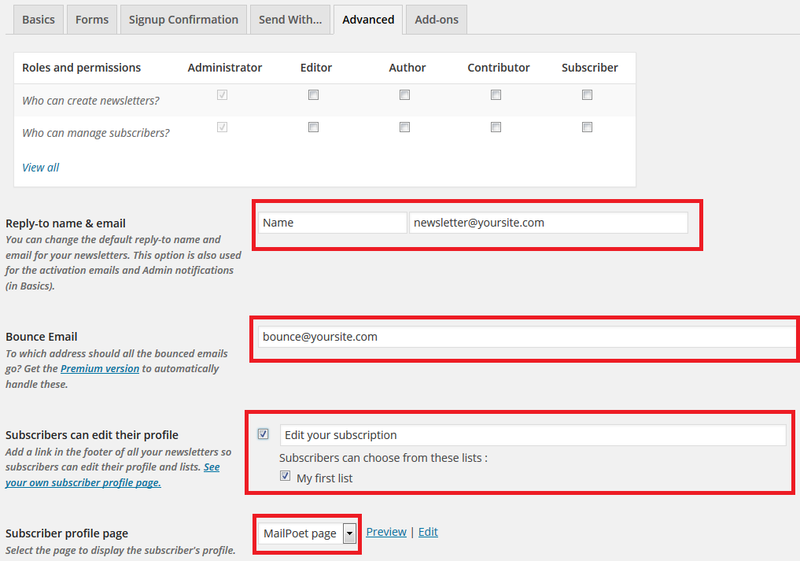 Then enter a Bounce Email, which can be the same email you use to send your newsletters from or another one. 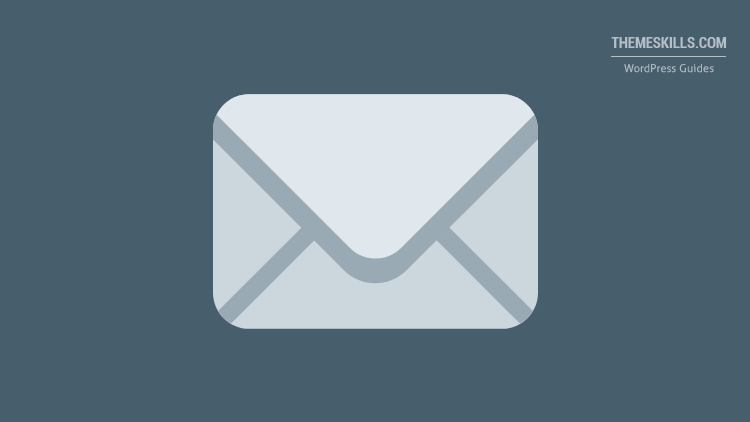 A bounced email is an email that never arrives in the recipient’s inbox and it’s sent back to the sender with an error message. Choose if you wish to let your subscribers edit their profile or not. Don’t forget to check the profile preview post to see if you like it. If you don’t, do what I said above. Check the add-ons to see if you find anything interesting and useful for you there. It will automatically add the Admin’s email into a subscribers list. You can edit that list, or create a new one. It’s dead simple. After you created your list(s), don’t forget to go back to Settings -> Forms, and add your list(s). You can also import subscribers by uploading a CSV file or by copy-pasting the list in a text box. Finally, you are ready to create a newsletter or use one of the 30 templates. 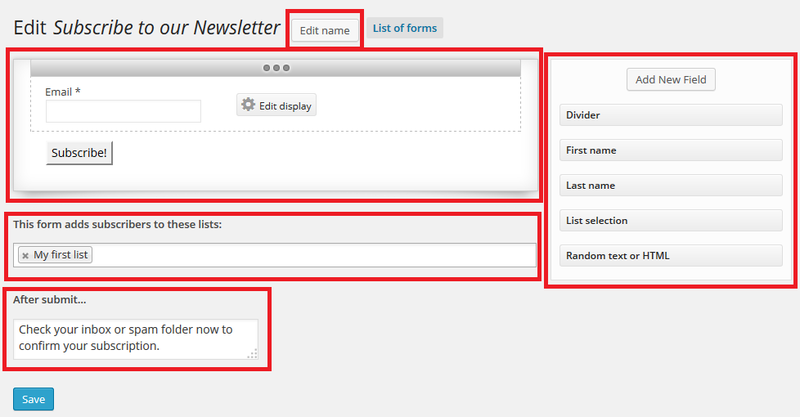 Let’s create one by going to Newsletters -> Create a new email (the button found at the top). 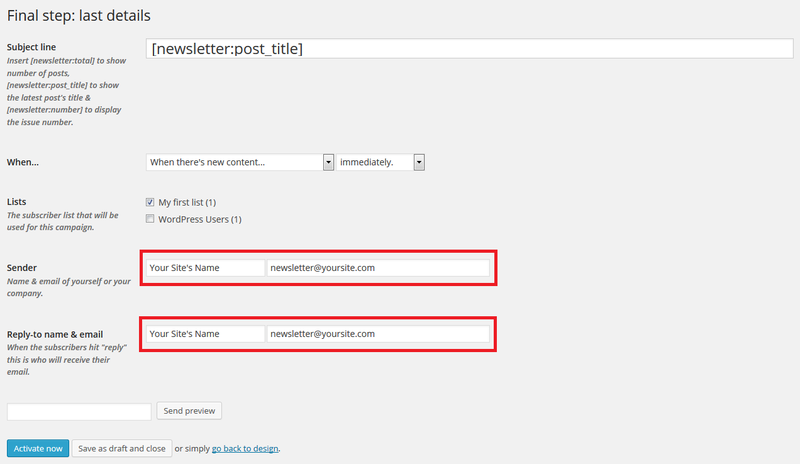 I suppose that many of you want to choose Automatic newsletter for your posts, so it can automatically send the emails. After that, choose when to send it. I suggest adding [newsletter:post_title] in the Subject line to show the latest post’s title. Then choose the list and click Next step. 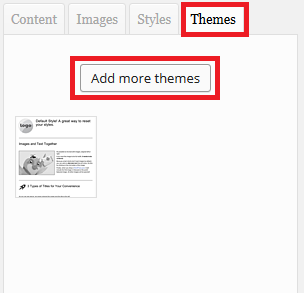 At step 2 you’ll see a default template, which you can edit in a thousand ways. 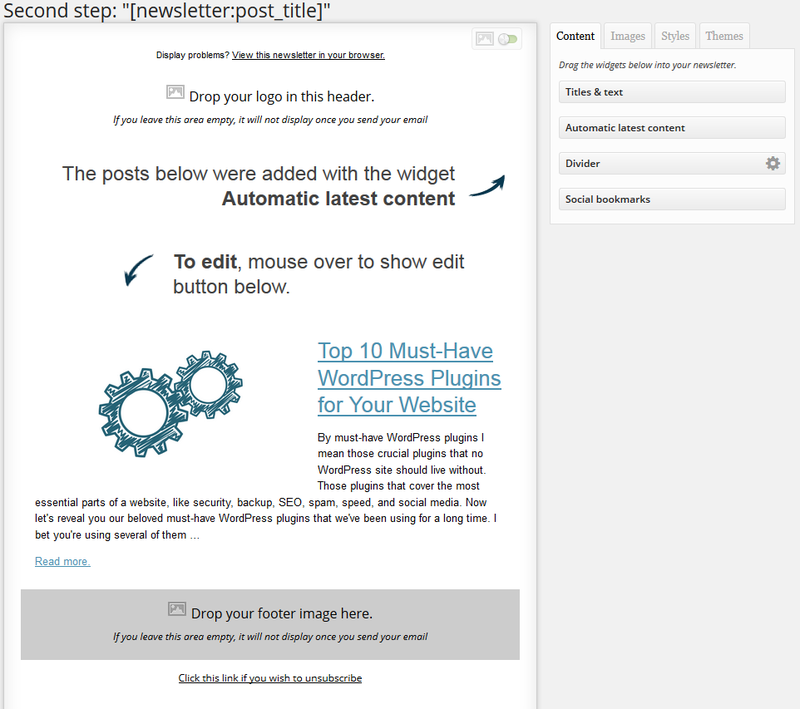 This complex drag & drop editor is the feature that truly makes MailPoet an awesome newsletter plugin for WordPress. As you can see, it already pulled our latest post with the Automatic latest content widget that you can see in the right. You can set that to show multiple posts in case you want to send a weekly email with all your new articles, for example. Once you’ve finished, scroll down, and right before the Save changes button, insert your email and send yourself a preview of what you’ve created. If you like what you see, press Save changes and then Next step. Now all that remains is to choose either you want to activate it, save it as a draft, or go back to the drawing board. One of the best newsletter plugins for WordPress or not? With all those awesome and flexible features you can create a great email campaign, without any hassle, directly from WordPress. What more could you ask for? For me, it’s definitely the best newsletter plugin out there. I like everything about it until now.